Victimology is the invention of Critical Race Theorists and Cultural Marxists, designed to oppress minority groups by making them identify with victimhood, which only results in stifling their innate genius, resolve, and ambition to better their own condition. By identifying as victims, even when there is no real victimhood, the division between identity groups grows and cultural dissension is increased, accomplishing the ultimate goal of Marxism, which is civil unrest. Black liberation theology actually encourages a victim mentality among blacks. John McWhorters’ book Losing the Race, will be helpful here. Victimology, says McWhorter, is the adoption of victimhood as the core of one’s identity – for example, like one who suffers through living in “a country and who lived in a culture controlled by rich white people.” It is a subconscious, culturally inherited affirmation that life for blacks in America has been in the past and will be in the future a life of being victimized by the oppression of whites. In today’s terms, it is the conviction that, 40 years after the Civil Rights Act, conditions for blacks have not substantially changed. As Wright intimates, for example, scores of black men regularly get passed over by cab drivers. First, victimology condones weakness in failure. Victimology tacitly stamps approval on failure, lack of effort, and criminality. Behaviors and patterns that are self-destructive are often approved of as cultural or presented as unpreventable consequences from previous systemic patterns. Black Liberation theologians are clear on this point: “People are poor because they are victims of others,” says Dr. Dwight Hopkins, a black liberation theologian teaching at the University of Chicago Divinity School. Second, victimology hampers progress because, from the outset, it focuses attention on obstacles. For example, in Black liberation Theology, the focus is on the impediment of black freedom in light of the Goliath of white racism. Third, victimology keeps racism alive because many whites are constantly painted as racist with no evidence provided. Racism charges create a context for backlash and resentment, fueling new attitudes among whites not previously held or articulated, and creates “separatism” – a suspension of moral judgment in the name of racial solidarity. Does Jeremiah Wright foster separatism or racial unity and reconciliation? Howard was referring to Maxine Water’s encouragement to Democrats and leftists to follow and harass Trump administration officials, quite possibly in violation of U.S. House of Representatives ethics rules. Of course, Trump has not “incited way more violence” than Maxine Waters. Such a claim is, in itself, absent any actual facts. Waters literally called for Trump officials to be targeted at stores, restaurants and gas stations by opponents and denied service and to be run out under protest. Trump has done no such thing. And then there’s another issue, that the greatest acts of violence in America are done to the unborn, and that’s the fault entirely of Kyle J. Howard’s political party, which includes Maxine Waters. Let’s think about this for a moment. Is anyone seriously believing that SBTS – one of the nicest, most pristine, safest and most prestigious seminaries on the planet – was “unsafe” for a woman of color? There have been no race-based acts of violence at SBTS. Heck, there haven’t been any notable acts of violence of any kind at SBTS. Let’s look at those statistics. Thankfully, the Michael Minger Act is a Kentucky state law that requires public colleges and universities (also at private institutions licensed by the Kentucky Council on Postsecondary Education) to report campus crimes to their employees, students, and the public. It was passed in 2000 and revised in 2004. This is the report for crime at SBTS, as made available on their website in compliance to the Michael Minger Act. Yeah, that seems like a really unsafe place. It seems that the worst (and only) crime to happen (or even be reported) is about 10 thefts per year of personal property (we presume from local residents coming onto campus we hope). 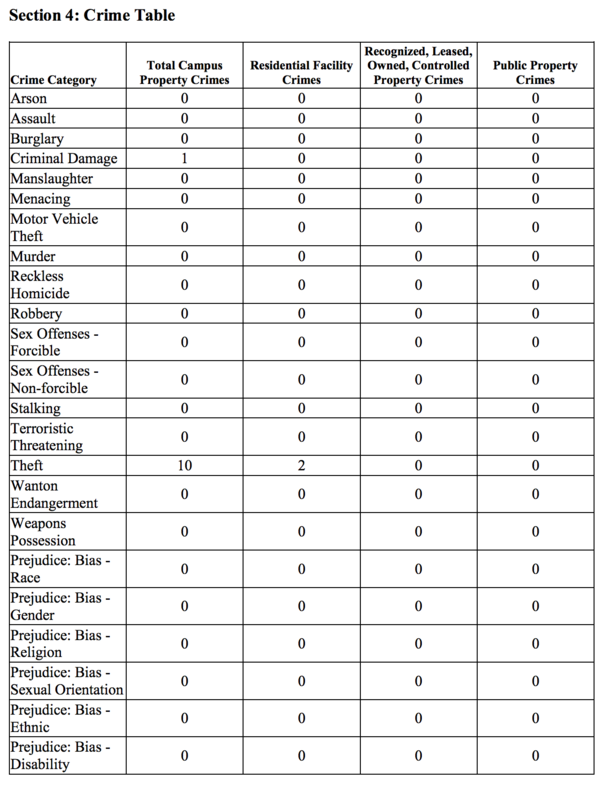 You might notice that the reported incidents of ethnic bias were at zero. You can find other years’ reports at SBTS here. And guess what? Similarly, there are no reported incidents of ethnic bias or systemic violence toward anyone. 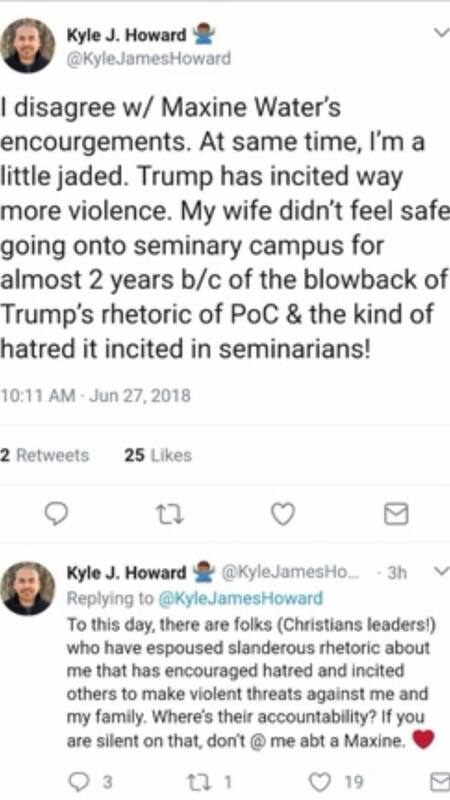 But that doesn’t stop Howard from making the claim that because of Donald Trump (somehow), his wife was afraid to go onto the campus of SBTS. But, there’s something else here that’s crazy. This is Mrs. Kyle J. Howard. With a maiden name that is Vietnamese in origin, and with an appearance that is, well…not black…one wonders why an Asian American is afraid to go onto a perfectly safe seminary campus. Is there an epidemic of random, racially-motivated violence against Asian Americans caused by the Trump administration? Is that a thing? In Critical Race Theory, being “black” has nothing to do with biology or ethnicity. It is, instead, about identifying with victimhood. To acknowledge yourself as “black” is really to identify with victimhood. Therefore, it is possible to be “black” even without really being black. We recognize this makes no sense, but we didn’t make this up; James Cone did. This is what Critical Race Theorists, Richard Delgado and Jean Stefancic, write about in their book, Critical Race Theory, as the theory’s third theme. Also known as the “social construction thesis,” they argue that race and relations are detached from biology altogether (Critical Race Theory, Second Edition, page 8). If you see yourself as a victim, you are “black.” If you do not see yourself as a victim, you are not black (which is why so many Marxists treat conservative black Americans with such contempt, referring to them as “fake blacks,” “Uncle Toms,” or “sell-outs.”) When they speak of “black Christians” as a homogenous, single-minded group, it’s simply because they don’t view black antagonists to their Marxist victimology, like Darrell B. Harrison, as truly being black – regardless their ethnicity. Any Asian woman who is afraid to go on the campus of SBTS because of Donald Trump (or their Caucasian-black husband who makes such a claim) is being asinine. No one believes that. No one believes that because it is absurd. And this is where you’ll get into another aspect of Critical Race Theory, which is the preeminence of one’s personal “experience” or “story,” which is to elevated above all facts and reason. Previous story Salt Mining with Thabiti Anyabwile – Are You Guys Even Christians?